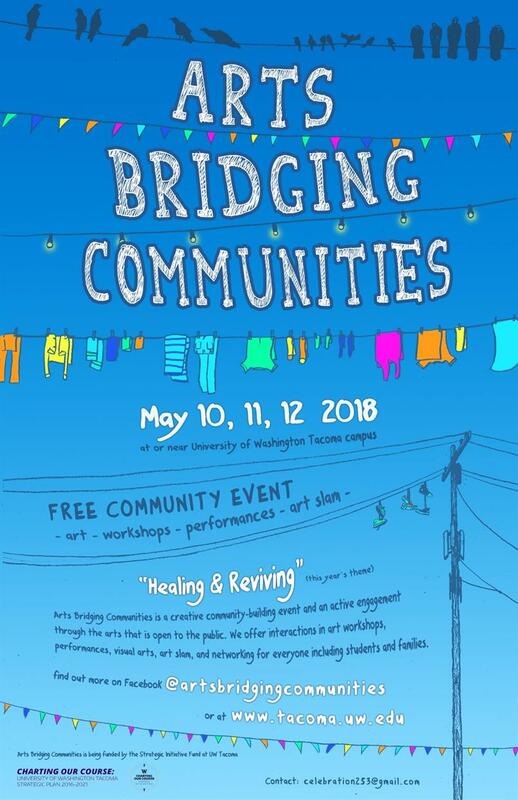 Saturday, May 12, 2018, 10 a.m. – 5 p.m.
You’re invited to join us for an arts celebration happening here in Tacoma during the next week. We’ll be offering an Arts Slam, workshops and chances to connect with community members. Through these events, we aim to foster socially-engaged creativity, discussion and community-building. These events are free and open to the public. Please share this message with your friends, neighbors, and loved ones. Light refreshments will be served. We hope to see you there! These events are being organized by faculty, students, alumni, and community members around the south sound. Funding for these events is provided by the Strategic Initiative Fund of the University of Washington Tacoma.